How to attract blog traffic?? READ THIS! Learn how to attract more traffic to your blog. I have been blogging for a few years now, but mostly as an exercise in putting my thoughts down somewhere I could reference at a latter date. During the course of this time, I might have had a few dozen followers a week. It gives me a good feeling to know that other people read my posts. More recently however, I have started taking my "Random Thoughts in Marketing" blog more seriously. I have started using tools outside of my blog in order to engage people other than myself to view,comment and interact with me. I have started to more actively "get myself out there" using different social networks such as Twitter, FriendFeed & LinkedIn and so many more. I use Twitterfeed to update my Twitter followers when I have a new blog post. I encourage my readers (contributors as well) to Comment, Digg or even Tweet me. (I bold-ed the aforementioned to highlight just how important this can be. Though I use the aggregating bookmarking icons like ShareThis, or AddThis I find that people like it when you keep it simple. So I give them a direct choice to the most important interactions). I make certain that my more important posts are stumbled upon (yes, even if I have to stumble the first one myself). I offer an RSS feed for my blog, and make it available to blog feeds. Most of you likely already know of and use some of these tools. Here are a few more though that you might not have thought of. A good portion of my traffic is not due to what I write on my blog, but rather what I write elsewhere. I set up alerts to monitor blog posts and articles of interest, and for which I believe I might be a SME. I make certain that when I comment elsewhere, I always sign it with my signature; www.twitter.com/A_F . Ultimately, if what I wrote about was of value, they will find their way to my blog eventually. Peter Shankman runs an excellent service called "Help a Reporter Out", or HARO for short. Reporters, and members of the media use HARO to locate SME's. Anytime I believe I can add value, I reply to these reporter's requests. Being quoted in the press can go a long way toward getting street cred toward being a SME. This article in Software Developer Times quotes me, which in turn led to another reporter asking my opinion on Google's Android (GPhone). Do not blog for the sake of blogging. Think about what you are good at, or have a passion for and specialize. Become a Subject Matter Expert (SME). Do NOT take your eyes off the ball. It is after all not important how much traffic you get, but how much of that traffic links to you, Tweets about your posts, and most importantly returns to read more in the future. What works for you in driving blog traffic? Let us know. If you agree with me, please DIGG this, and as always be sure to say hi on Twitter. Pitch it, pitch it (Pitch it real good). 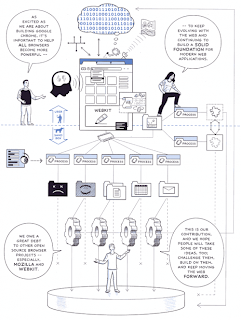 Web 3.0 your CONSUMER will design your product! In earlier posts I commented on my vision for what Web 2.0 is, and what Web 3.0 will be. While I stand by those comments, they were more from an infrastructure standpoint. I want us to now think about the same question - how it relates to, and what it means to marketing your brand. If ever there was a definition of Web 1.0, it was "advertising". At the advent of the Internet, most brands simply did what they had always been doing offline. Static one way communication, as dictated from marketing, or some advertising agency. With Web 2.0 it gets interesting, and more importantly interactive. Now I hate using other's cliches, and I am certainly not the first to state this; Web 2.0 is about interacting, or as Chris Brogan often uses the term - *listening*. Since most of us are clear about what Web 1 & 2.0 are, lets look for a moment about what Web 3.0 might be (recall this is all as it pertains to marketing a brand - a subject that came up during an excellent Chat hosted by @lindydreyer). these groups will shape everything from what you will be able to charge for your product, to what that product is. Think I'm crazy, then you need to visit Fusion Center. Fusion Center, is a business that was built entirely by a crowd of people who shared a passion for a product that did not exist. The resulting business has produced over 26 products - ALL thought up by the crowd. Not one product that they produced was based on an internal (to the company) thought . The resulting products are exactly what their consumer wants, and priced more efficiently then any products that have since entered their space. What is your vision for marketing in a Web 3.0 world? PLEASE COMMENT and tell me YOUR vision, or if you liked this Share It. Want to comment in private, send me a Tweet. Mobile Tagging see the future NOW! Most who know me, know my vision for the cellphone of the future. It will replace everything, and simply be a conduit device that interconnects anything that in turn is connected to the Internet. For example, you will simply place it on a table in your living room, and it will pull video content from the web, projecting it on the wall (likely holographic eventually) and as such will negate the need for you to have a TV. I know, that vision is constrained by bandwidth, battery life an other factors. We will not be able to use that vision of Mobile for 5-10 years. But do you want to see something that's as fun, and is likely right around the corner? When asked how it worked, Iguchi replied "We have a patent! "...The room was hysterically laughing at his reply. Based on these two aforementioned assumptions, the so called expert panel panned the business model behind Sekai Camera. They asked and made comments like "What would happen if something that had been tagged , was not longer there?" 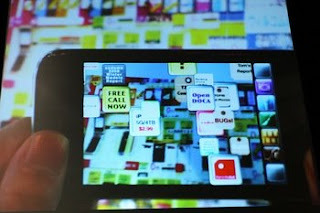 (in one example in the video, Iguchi points his Iphone in a store's window at a Camera for sale, and is shown a tag telling him more about the camera). I believe that based on lack of vision, these panelists dismissed Sekai Camera right then and there. The panelists got it wrong!! We will see something like this soon, if not from Sekai Camera, then from others. In my vision for this model, I have already answered all the objections that the panelists had. The tags will come not just from user generated Geo Tagging. The tags will also by via Bluetooth, RFID, Barcode scanning, and from databased (corporate) info. about the items. 1) Read about Empire State building (could be Wikipedia based). 2) See pictures of the Empire State building (perhaps pulled from Flickr). 3) See videos of the Empire State building (YouTube). Well you get the idea...I am just surprised that the panelists didn't. What do you think of Sekai Camera's business model (I think it is spot on and is the future), and what would you like to see for mobile? Please leave your comments, Digg this, or Twitter me. People who have followed my blog over the past few years will recall my thoughts that part of Web 3.0 will be truly everything, on any device. So as I sit watching one of my favorite TV shows, Fringe - There will be a series of smaller boxes on my TV screen. These boxes will consist of an Oovoo like box, for my video conferencing with my fellow Fringe peeps, an email box, a Twitter feed and other "widgetized" boxes I might add such as my Facebook. Perhaps my brother will call me, a "phone" box will pop up from the corner of my TV screen and alert as to who is calling. Should I want to accept the call, Fringe will minimize and the call box widget will take over my screen's focus. We will not see this type of convergence within TV's themselves natively for at least another few years. Recognize however how your TV (Cable) is being delivered today, and note that the tuner is more often then not in the form of a Cable box. Cable boxes run on software, and thus are programable. 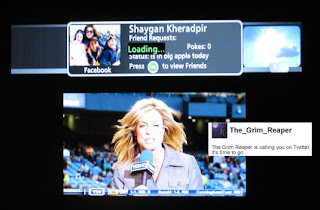 So while this functionality will not be embedded in TV's soon, it will be coming to your Screen soon, REALLLY soon! From a recent Verizon FIOS press conferance comes word that FIOS will this fall (read NOW) will be offering just such a service (well at least the beginnings) for a mere $4.99 extra per month. Verizon will ultimatly monetize this further by allowing users interactive ability to perhaps purchase products they see within a TV show or movie, by simply pointing their remote at the screen. Expect the first generation of this offering to be slightly lame. What excites me the most however is the prospect that following the Open Source trends we see elsewhere, Verizon will allow third parties to create "Widgets" that run in the cable boxes. Twitter (and other social media- are you listening...time to make a widget for FIOS. What do you envision for an integrated focal point going forward? Please leave a comment, Digg this, or interact with me on Twitter. Twitter - It's really about your EGO! Momentum... There is already a mass. of users on Twitter, so I can easily find Tweeple I know to socialize with. Open API's... By opening up access for other developers to make useful add-ons, Twitter has made itself the hub in an ecosystem. Not only does the increased functionality attract new users, and new uses for Twitter. These apps. add to the natural viral nature of Twitter by bringing in new users of their own. Ubiquity... Unlike past communications platforms (Cellphone/Instant Messaging / Email) Twitter is ubiquitous. I can send and receive Tweets whether I am at my PC, on my Cell phone, or even via Instant Messenger (using third party tools). But do you want to know the REAL hidden reason for Twitter's success? Shhhh, promise you won't tell anyone and I will let you know their secret. Sure there are business uses for Twitter, I use it to announce new blog posts (many others do as well). But just like social networks in general, with Twitter it's all about the ego. Unlike other social networks however, Twitter magnifies this effect. I call it the "TweEgo" factor. It is so prominent that there are already tools available to tell you just how popular you are. Twitdir shows you the top 100 Twitterers (most followed). There are also tools to show you just how pathetic (unpopular) you are. Everyone wants to be popular, and on Twitter it's all about how many people follow you. Most of the Tweeple I follow play in the social networking sandbox...a space I am passionate about. There are Kings and Gods in my network. I follow @Chrisbrogan (he has over 14k followers), I follow @jowyang (Jeremiah has almost 12k followers). I also enjoy the musings of VC's, so I follow @fredwilson ...(Fred Wilson has over 6000 followers, but he follows back very view...good TwitGradr score). Want to follow a superstar? @Kevinrose has over 60k followers! MEDIA - When you massage someone's ego in the media, you hit homeruns. Just ask @waltmossberg (new to Twitter but already almost 1k followers and no follows). The only thing bigger than Walt Mossberg's ego is the 2 foot long cigar that hangs out of his mouth. I would be shocked if Walt did not review Twitter for his very popular Wall St Journal column over the next few months. When he does, he will see his follower count go up over ten fold overnight! I expect media coverage of Twitter to explode over the next twelve months. This is HOMERUN PR for Twitter and it don't get any better than that! PS - Make sure you follow me, retweet this post or Digg it! My TweEgo needs to be massaged! Jeremiah Owyang over at Web-Strategist threw out some interesting ideas about what Google's new Chrome browser means. I tried to extend upon what he writes by looking at the implications that this will have - dependent upon how you interact with Google. Over the US Labor day holiday, the beans were finally spilled on one of the best kept secrets of the past few years. Despite public comments to the contrary, Google has been working on their own internally developed browser. The resulting Google Chrome Browser has important repercussions for everyone. It is just that it is different depending on who you are. This means that if it were not enough of a conflict of interest (Iphone VS Google's Android) to have Google CEO Eric Schmidt sit on your board - It is now. Look for Schmidt to resign sometime in the next six months. This means that if you ever considered making Internet Explorer open source in the past, now is the time... You can not afford to wait, not even another minute. Expect Microsoft to make Vaporware like noise over the next few months about cloud widgets to give IE closer ties to cloud based initiatives. In a post way back in January we wrote about some of what Yhoo would need to do to be relevant. Now you can add to this list, you need to buy Mozilla. Keep your friends close, and your enemies closer...yes continue with your Google revenue deal, but learn how to monetize your Browser outside of a paid search deal. Leverage your large user base to form "spin-off" type "power of the crowd" businesses. Note to Firefox, hey you guys ARE a social network...you just haven't figured that out yet. Realize that Java is even less relevant every day. First we kicked you out of client side computing because you were a resource hog. Realize that Java will now continue to be less and less relevant on the Server. What a waste of a good company... McNealy must have got hit in the head with one to many hockey pucks. In a previous post, we talked about how that in the future your "social networks" would follow along with you in the browser. Truth be told, we thought it would be Facebook, or even more likely Firefox that would lead in this initiative. So if you are a social network, you need to know now Chrome is the first step in a series of moves that will make it unnecessary for your peeeps to ever visit your site (directly) again. Life used to be simple, eh? You knew that you should be developing applications for Windows, because that is where the 100's of millions of users were. Fast forward, and now you need to choose what platforms to support, and when. Of course it makes sense to develop for Windows still, but Apple now has a mass of millions of Mac OSx users, and if it a browser based app, write once for Safari, and it should work without much adaptation on the Iphone. There are over a billion cell phones in use world wide, however every phone requires writing to separately (yes even all those different flavors of Java are different phone to phone. Suddenly with Android coming, and a matching desktop browser you need to be here. There is always a bottleneck somewhere ... Think back 5-10 years ago, before what we now refer to broadband... Dial up was painffulllllyy slow, and when you tried to browse, the bottleneck was in your "last mile" connectivity. Once you got broadband, the lag time in reaching a site was likely in your PC (not enough ram, slow processor, etc). Before either of those issues though it was the software that was not "smart" enough to keep up with the ever faster CPU's being created. Look for Chrome to optimize all these new "cloud" based application initiatives like Google Gears, etc. This is just another nail in the coffin for desktop based computing. In 10 years, likely 90%+ of your applications will reside somewhere outside of your home or workplace - but certainly not on your desktop. What does it mean to you? Why not leave YOUR comment? Shy? Tweet Me your answer.